Mystery of the Misspelled Word Solved! 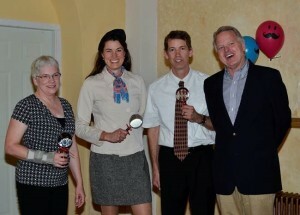 Deb Nicholson, Tinker Duclo and Bob VonAchen solved the mystery of the misspelled word at Spellebration on Friday, March 15 at the Hotel Colorado. This team of three spellers, sponsored by Colorado Mountain College West Garfield Campus, successfully defended their title as the best spellers in Garfield County. They correctly spelled the penultimate word, “treen,” and then “opsimath” to win, narrowly beating the team sponsored by Valley View Hospital. Photo Courtesy of Consuelo Cota. Last year’s champions, Deb Nicholson, Tinker Duclo and Bob VonAchen, celebrate their first place finish with pronouncer, Robert Noone at Spellebration 2015. The Best Costumes award went to Martha’s Detective Agency, sponsored by Linda English, and the top fundraiser was Glenwood Springs’ 100 Club and their team The Reddish Herrings. Spellebration is a joint fundraiser to benefit Literacy Outreach and the Colorado Mountain College learning labs to support the many adult literacy learners in Garfield County. These programs are grateful for the support of the 31 teams of spellers, the event and team sponsors, and the silent auction donors and purchasers.